The Department of Natural Resources (DNR) will present its official kickoff to summer, filled with outdoor fun for the family - from hands-on fishing and archery to the chance to meet Smokey Bear and get an up-close look at wildlife - from 11 a.m. to 6 p.m. June 22-24. Offered in conjunction with Detroit River Days, activities will take place along the Detroit International Riverfront, from the new Detroit/Wayne County Port Authority Terminal & Dock (just west of the GM Renaissance Center) to Rivard Plaza and William G. Milliken State Park and Harbor. "Participating in River Days is a way for the DNR to reach out to the Detroit community and let people know about our programs and our partnership with the city of Detroit and the Detroit Riverfront Conservancy," said DNR Director Rodney Stokes. "It is also a chance for us to give folks a taste of all the outdoor recreation opportunities Michigan has to offer, with a variety of Recreation 101 events happening at Milliken - Michigan's first urban state park." Recreation experts will be available to help participants try their hand at activities like fishing, birding and disc golf. 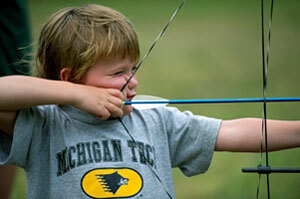 Visitors to Milliken State Park also can learn more about camping, hiking, biking, paddling and archery. The DNR will offer about 20 activities and exhibits in all. Expert instructors include the Michigan Geocaching Organization, Wheelhouse Detroit, Simple Adventures and DNR staff. Hungry for more? River Days attendees can enjoy a free taste of Hudsonville's Pure Michigan Caramel Apple ice cream, the official flavor of Michigan State Parks. River Days is a celebration of Detroit's Riverwalk that highlights the transformed waterfront area in downtown Detroit with activities on land and water. For more information on Detroit River Days, visit www.riverdays.com. For a schedule of DNR recreation events and exhibits, visit www.michigan.gov/dnrcalendar and scroll down to "DNR's Official Kickoff to Summer."